A Warm Welcome for a New Gmail Inbox? In the world of internet marketing even passive participants have had to become okay with change. Being sedentary in an ever-evolving world will leave you feeling lost, confused and completely dependent. But change isn’t always easy to accept and recently email marketers are having a bit of a hard time deciding if the newest evolutionary changes made to Google’s Gmail are to be welcomed or rebuffed. Amongst other slight changes, the most prominent new features noticed by Gmail users are the customizable tabs standing in as the new inbox. The purpose of the tabs is to put the user in control of their own inbox, as well as to help add organization to a sometimes chaotic message area. The tabs are easy to customize and are available on Gmail’s official mobile app. The default option organizes your inbox into three main tabs: primary, social and promotions. The primary area is allocated to important personalized messages; these messages get initial viewing rights and are displayed in the forefront of your inbox. What worries marketers is the black hole that has been titled the “promotions” tab. It is here that all degrees of advertisements get automatically filtered into, be it opt-in editorial pieces or unwarranted spammed promotions. Although worried about being overlooked and easily passed by, rather than speculate, email marketing companies look to the numbers first to see if the “new inbox” has had any real impact on their marketing campaigns. Although the jury appears to still be out and it may be a bit too early to come to any true conclusion about the negative effects, if any, of tabs on marketers’ bottom-line. Many larger companies use their open rates to see if any change has occurred. So far the results have been mixed, but overall somewhat underwhelming. In a recent analysis performed by MailChimp whose users send out a total of 1.5 billion emails, in the 6 week block around the time the new inbox was introduced, they discovered that open rates dipped from an average of 13% for 15 weeks straight to just hovering over 12%. Although MailChimp normally sees fluctuations around holidays, this 1% dip has maintained over a three week period which is cited as an abnormal behavior. Other industry professionals agree that they too have noted some slight decreases in open rates, but explain it is ultimately too early to come to a definitive conclusion. So even if the new tabs have caused minor reductions in open rates, instead of playing the blame game marketers should see this as yet another opportunity to outshine the competition and focus their efforts on creating content their customers and demographic wants to read. If email marketers are afraid of losing their messages in the shuffle and falling deep into the black hole that is the promotions tab they must put an end to the spamming and put forth newsworthy, interesting content. Another route some marketers have decided to take is to create a campaign helping their users understand the changes taking place in Gmail, and explaining how to permanently move messages from promotional to primary. 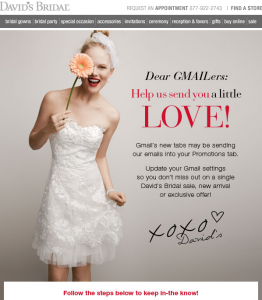 David’s Bridal is one such company, taking the initiative to get ahead of the curve by sending out an educational email campaign to its Gmail subscribers. Google’s algorithm will continue to evolve to better predict searcher intent; gone are the days of trying to outsmart the search engine powerhouse. Instead effective email marketing campaigns will have to learn to play by the rules.